It's that time - the Roundup for our Selection of Dinner with Edward. All in all, everyone seems to have loved the book, though a few were not really enthused about Isabel's own part in the story. I'll share a short clip from the entries and the dishes we were inspired to create, along with links so that you can visit for the full story. First up was Amy of Amy's Cooking Adventures, who said: "It was so easy to love Edward. Through the book, I felt like I was really able to get to know Edward. Edward was worldly, yet old fashioned, and utterly charming... 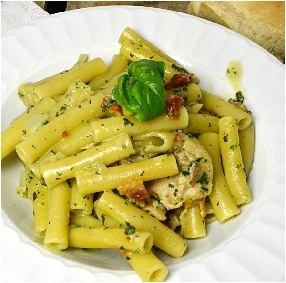 There was plenty of food inspiration throughout the novel"
Amy prepared a scrumptious sounding Creamy Basil Chicken with Pasta. 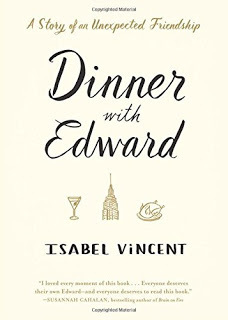 Next in was Camilla of Culinary Adventures with Camilla, who loved Edward, but not the author so much, she commented:, "Despite the fabulous food in Vincent's book, I had a difficult time liking her or even relating to her. It was, however, easy to adore Edward. His devotion to his wife, his old-fashioned views, and his culinary acumen made him absolutely charming." 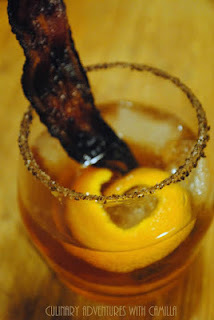 Inspired by Edward's love affair with his wife, Camilla came up with her own cocktail creation, which she calls Manhattan Honeymoon with Candied Bacon. 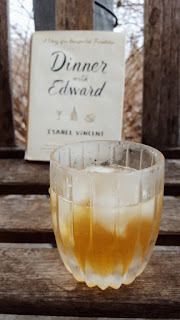 Then, Terri of Our Good Life who said: "Even though the book was a memoir of the author and the strife she was going through when she met Edward, it was truly about the remarkable Edward, with whom I fell in love. He's a gentleman, a foodie, a purveyor of all that is lovely and wonderful in life, including a good bourbon and roast chicken." Terri prepared a dish from the book, Chicken Roasted in a Paper Bag, which sounds like a fun idea, as well as being delicious. Next up Debra of Eliot's Eats commented: "Since Edward is the host-with-the-most and never lets his guests linger long without a cocktail, I had to make this guest-pleasing, well-chilled drink." A Special Cocktail created by Edward, which incorporates an anise-flavored liquor. She also compiled a list of tips for entertaining, courtesy of Edward, of course. Simona of Briciole, thought the book was a "delightful memoir" and says: "I immediately took to the story, in part because Edward reminded me of my beloved Uncle Domenico. Though he was not a cook in Edward's way, our friendship developed over shared food and meals." 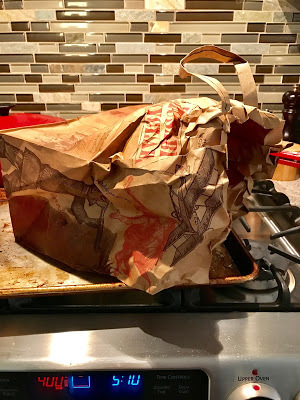 She was also inspired by Edward's herb-roasted chicken in a paper bag to make Chicken Meatballs. Tina of Novel Meals, really enjoyed the book. She comments: "It’s about love, friendship, understanding with a bonus of fantastic menus. I’m sorry I didn’t read it sooner when bookish friends were writing about it." 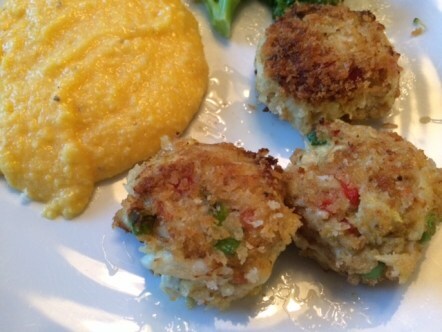 As a great addition to our feast, Tina made us some yummy Crab Cakes with a side of grits! Ali of Fix Me a Little Lunch, thought the book was: "...a charmer. 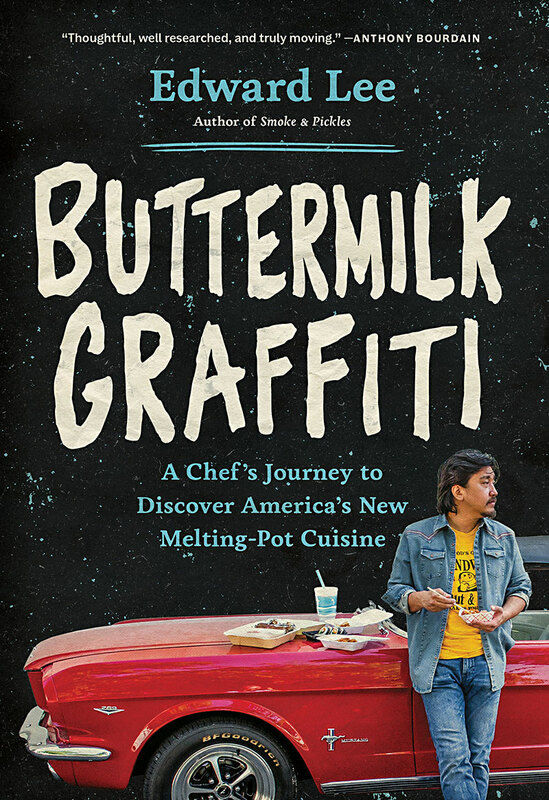 It’s a quick read, filled to the brim with amazing food stories, menus, and inspiration... It’s a book about friendship and food, both of which cut across generations. 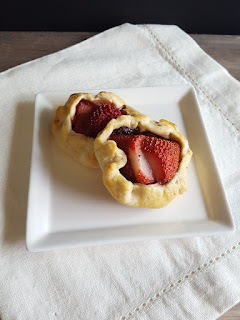 Inspired by Edward's Apple Galette, Ali brought - Mini Strawberry-Chocolate Galettes to our Round-up feast. Cathy of Delaware Girl Eats says: "Unexpected and often good things happen when you do something for someone else. Often true in life, this axiom is also the premise of Isabel Vincent’s book “Dinner with Edward”. 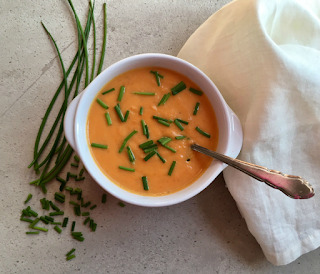 She posted a tasty looking Cream of Roasted Carrot Soup. And my fellow Hawaiian, Deb of Kahakai Kitchen said: " I enjoyed spending time with Edward as much as Isabel did and was sorry to have the book end so quickly (it's only 224 pages). 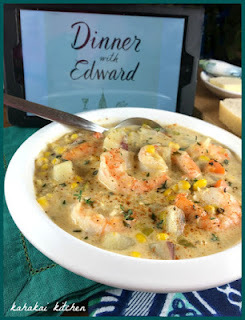 Of course any book that describes food so well and so lovingly gets extra points in my book--I wanted to eat and make so many of the dishes mentioned..."
Deb also bought a soup to our feast, one I was hoping someone would make - Edward's Shrimp and Corn Chowder. Finally, my post - Claudia at Honey from Rock, I totally enjoyed this memoir about the friendship of two disparate individuals, who both bring something to their relationship which helps the other at a time of need, and encourages growth in the process. 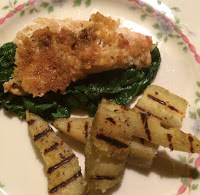 I posted a Meal in Memory of Edward - the dinner he prepared for Isabel on his wedding anniversary, which included Cod alla Franchese, on steamed spinach, and grilled sweet potatoes. Finally, a last, last addition, that had slipped through the cracks, from Wendy of A Day in the Life on the Farm, who said, "Isabel does not come across as a very likeable character however Edward makes up for it in spades. Edward is a loveable, caring, concerned father figure for Isabel. He comforts her with food, drink, hugs and fatherly advice. ... I think Isabel wrote this story solely as an homage to Edward and she portrayed him perfectly." 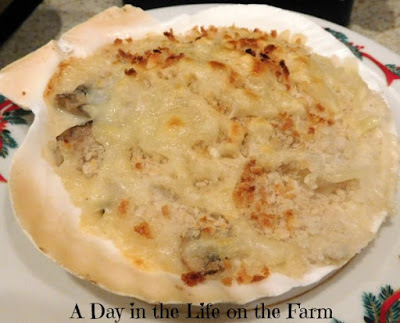 Wendy posted Cocquilles St. Jacques. A very elegant, Edwardish sort of dish, despite it not being mentioned in the book. If you missed out on this round, and like books, especially Foodie books and food, do consider participating in the next one, which is our April/May selection, Life from Scratch by Sasha Martin, in which we read another memoir about the healing power of food, this round hosted by Debra at Eliot's Eats. Submissions are due by end-of-the day on May 31, 2017. Anyone can join by reading the current selection, preparing a dish inspired by its contents and writing about it. Cook the Books has been memoir heavy for our 2017 early selections. So far we have read about the trials and triumphs of author Jessica Fechtor in Stir. We have met a lovely older gentleman and have been graced by his wisdom in Isabel Vincent's Dinner with Edward. We'll round out the first half of 2017 with Mastering the Art of Soviet Cooking: A Memoir of Food and Longing. 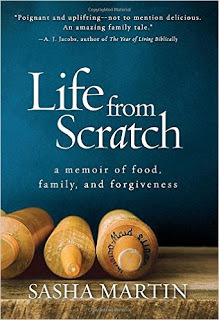 For the current April/May selection, Life from Scratch by Sasha Martin, we read another memoir about the healing power of food. 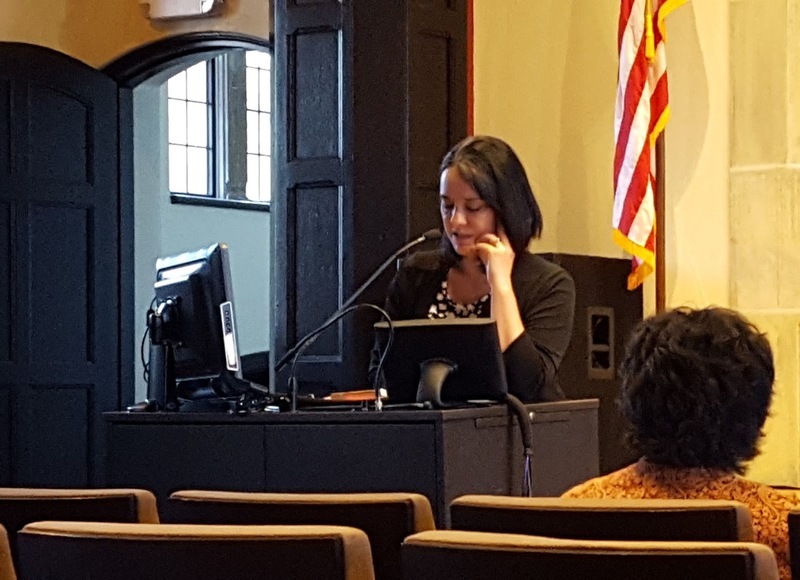 Martin tells of her unorthodox childhood in Boston, her troubled teenage years in Europe, her days in culinary school and her first "adult" job in Tulsa, Oklahoma. 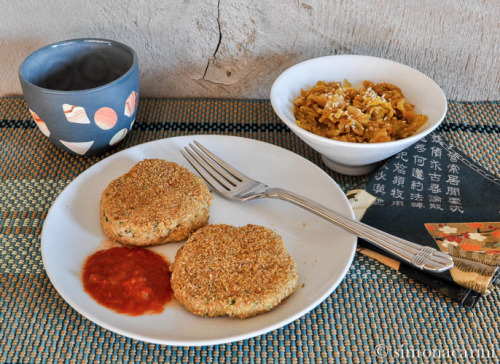 The travels don't stop there and Martin challenges herself to cook her way around the world from her tiny kitchen in Oklahoma. She chronicles this quest on her blog, Global Table Adventures. Through the course of Life from Scratch, Martin finds love, acceptance, forgiveness and family. There are plenty of international recipes included in Life from Scratch and you might also be inspired to cook a meal from one of her many childhood memories centered around food. Or, you might find your inspiration from her blog. I hope you pick up a copy from your local bookseller or library and join us for this round. Submissions for this round of Cook The Books Club, hosted by Debra at Eliot's Eats, are due by end-of-the day on May 31, 2017. Anyone can join by reading the current selection, preparing a dish inspired by its contents and writing about it. Let me know when your entry post is up by commenting on this post and/or sending me an email at eliotseats@gmail.com. If you are new to Cook the Books Club, you can find out more at the Guidelines page. Postscript: Through an amazing bit of serendipity, I was able to attend a two-day food writing symposium with Martin this past weekend. I have a totally new appreciation of her book. It was so interesting to hear her talk about writing this book in only one year, the publisher's demands and ultimately how the book took on a life of it's own and morphed into something unexpected.